Hong Kong's annual badminton event, “YONEX-SUNRISE Hong Kong Open 2018” was successfully completed on 18th November. The 6-day event attracted more than 30,000 spectators. More than 250 athletes from 18 countries and regions included gold medalists of 2016 Olympic Games, 2018 Asian Games, 2018 World Championships and the top ten players in the world have staged exciting competitions for Hong Kong fans. The final event day tickets were sold out on the first day of sale (October 16th). Hong Kong Badminton Association (HKBA) sincerely thanks all sponsors, subvention bodies and support from members of the public. South Korean Son Wan Ho picked up where he left off yesterday to defeat his second Japanese opponent in a row at the YONEX-SUNRISE Hong Kong Open Badminton Championships 2018. The World No.6 came back from behind for the second straight match to defeat Kenta Nishimoto 2:1 in the Men’s Singles final. The victory ended Son’s two-year wait for a title, and he lifted the trophy in Hong Kong for the first time since 2014, making him the first Korean player to triumph twice in Hong Kong. Japan’s Women Badminton Team created history today at the YONEX-SUNRISE Hong Kong Open Badminton Championships 2018! World No.1 Women’s Doubles pair Yuki Fukushima/Sayaka Hirota defeated their South Korean opponents in the final, before Nozomi Okuhara knocked down Thailand’s Ratchanok Intanon in the Women’s Single final. The trio became the first ever Japanese players to ever crowned as Women’s Single and Doubles champions. As the YONEX-SUNRISE Hong Kong Open Badminton Championships 2018 draws to a close, the Finals has been attracting numerous celebrities to the Hong Kong Coliseum, giving the audience a star-stunned lineup both on and off the court. As YONEX-SUNRISE Hong Kong Badminton Championships 2018 draws to a close at the Hong Kong Coliseum today (November 18), the tournament organizer held a grand opening before the start of the five finals. Led by a stunning drums performance, the atmosphere inside the arena reached its climax in no time. Local favorite Lee Cheuk Yiu fell to Japan’s Kenta Nishimoto at this evening’s (November 17) YONEX-SUNRISE Hong Kong Badminton Championships 2018 Men’s Single semi-final. Despite losing 18:21, 12:21 in straight games, Lee achieved his personal best results at the Hong Kong Badminton Championship. Following his defeat, the Hong Kong Badminton Team also concluded their participation at this year’s tournament. As YONEX-SUNRISE Hong Kong Badminton Championships 2018 is reaching its climax, lots of parents bring their kids to the Hong Kong Coliseum today (November 17) to enjoy the exciting matchups as the perfect Saturday parent-child activity. Among them are local fans who support each and everyone of the Hong Kong Team players, and had been following the tournament for the fourth consecutive day, while Indonesian fans also flew in to support their compatriots. 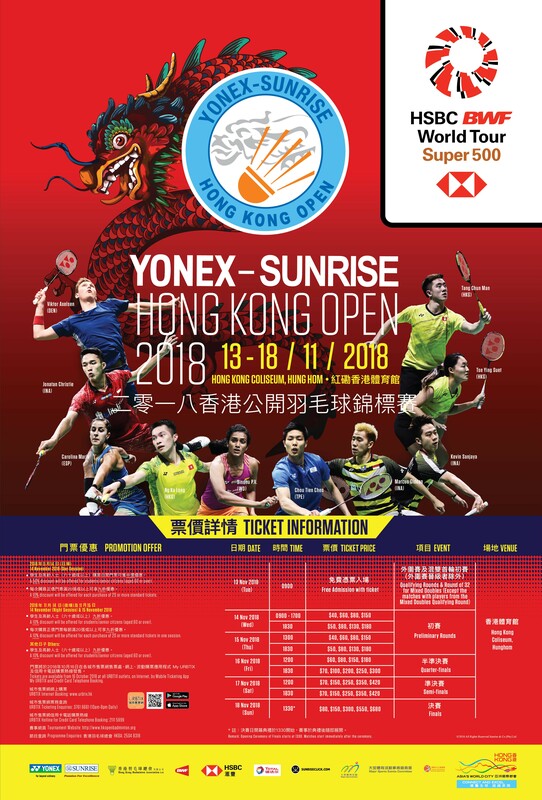 YONEX-SUNRISE Hong Kong Open 2018 part of the HSBC BWF World Tour Super 500 tickets are available for sales at URBTIX from 16 October onwards. The first match day will be held on (13 Nov). Patrons may request for free tickets to the event. For details, please click here. Tickets for 14-18 Nov are available for sales at URBTIX from 16 October onwards. Please click here for Ticket Price Table.